“Nobody wants to push a cart in a warehouse, humans are much better at many other things,“ Ángel Hernández of the Silicon Valley startup Fetch Robotics knows that. Franz Hero, responsible for Supply Chain Development at SAP, agrees. Find out how the two companies work on the warehouse of the future. 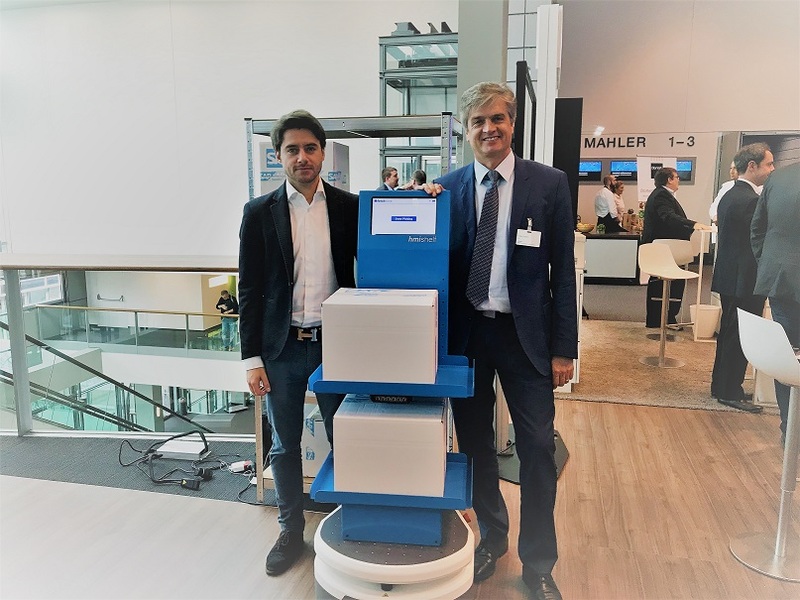 After having met only a year ago, at the SAP info day for Warehouse and Logistics, Franz Hero’s team worked on integrating the Fetch Robotics’ solution to SAP EWM (Extended Warehouse Management) to increase the efficiency in warehouses. Franz knows every step from Supply Chain Planning to Supply Chain Execution, Transportation Management and Warehouse Management. When he met the Fetch Robotics team, who offer a fleet management software and move goods from A to B in warehouses with no landmarks or any external devices, he could picture the increase of efficiency in warehouses right away. Robots in warehouses – here is how it works. “We have quite a few use cases where autonomous guided vehicles (AGV) or autonomous vehicles (AV) are used in warehouses in combination with EWM. For example, in the SAP warehouse in Walldorf,” tells Franz. Ángel adds, orders are now geolocalized within the warehouse. By making use of the business intelligence provided by the SAP EWM the robot goes straight to the next pick or the packing destination without any human intervention. Pickers can now be more efficient since they do not waste time on the transport after they have pulled an item from the shelf. “We basically don’t know anything about the order in theory. Therefore, working with a company like SAP brings a lot of value for our end customer,” Ángel explains. By getting insights from the SAP system and combining them with the Fetch technology, it makes orders and transportation completely transparent. Ángel offers yet another perspective: “For me it’s to remove those dull tasks that nobody wants to do. Nobody wants to push a cart in a warehouse, humans are much better at many other things.” His vision is to keep up with human needs and remove tasks that do not need their intellect. “Maybe removing the risk of driving a fork lift and instead let a robot take care of that.“ Having robots do the full autonomous picking process is something we will see in the near future, as the startup is already working on it. RK Logistics, Fetch Robotics and SAP – Robots are The Future. Learn more about SAP Extended Warehouse Management. Next Tags, Tags, and yet more tags – Question / Answers what tag to use?